My first vist to Chateau Villandry was pretty inauspicious. On a cycling tour of the Loire with friend Helen, I was pretty chateau'd out by the time we got to Villandry. Helen was still game for yet another chateau tour but I opted to sit outside and read a book. A couple of decades later (maybe more), on another cycling holiday, I found out what I'd missed. There's been a building on this site since 1189 but the Chateau as it stands to date was built around 1536. It was the last of the great renaissance chateaux to be built along the Loire. By the 19th century the chateau had an English style park around it but in 1906 it was bought by a Spaniard, Joachim Carvallo, who was determined to reinstate the original renaissance gardens. 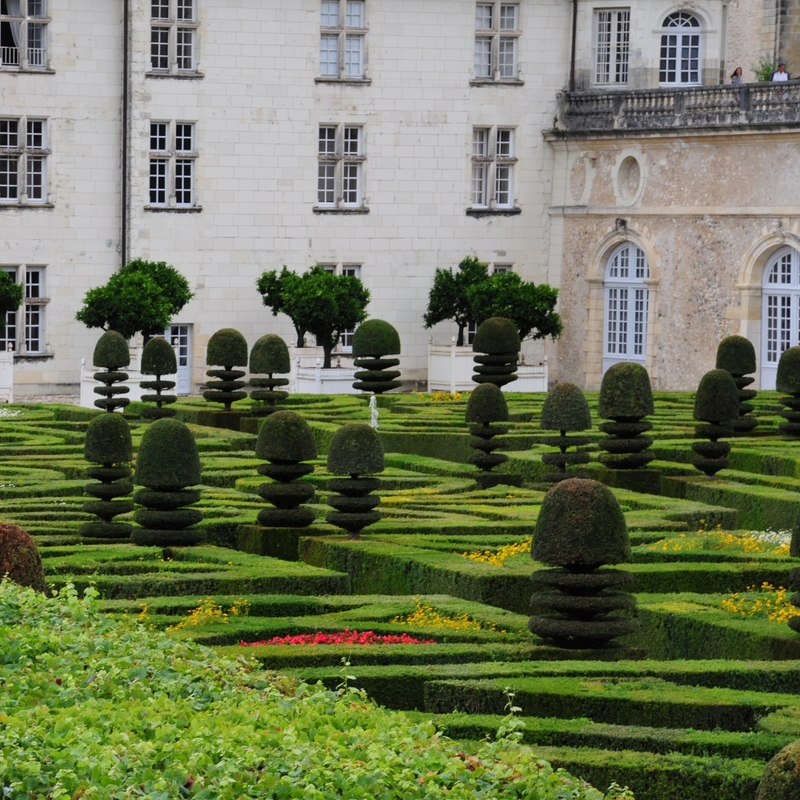 The gardens are extremely formal, symmetrical, loaded with symbolism and mostly set out in the form of parterres. This means they are best viewed from above, historically from inside the chateau, but also from various vantage points around the garden. The scale of the gardens, and the intensity with which they are gardened, is quite astonishing. The Ornamental Garden contains several parterres symbolising different forms of love - "tender love", "flighty love" etc, etc. Another parterre contains a Maltese Cross, a Languedoc cross, a Basque cross and stylised representations of fleurs de lys. 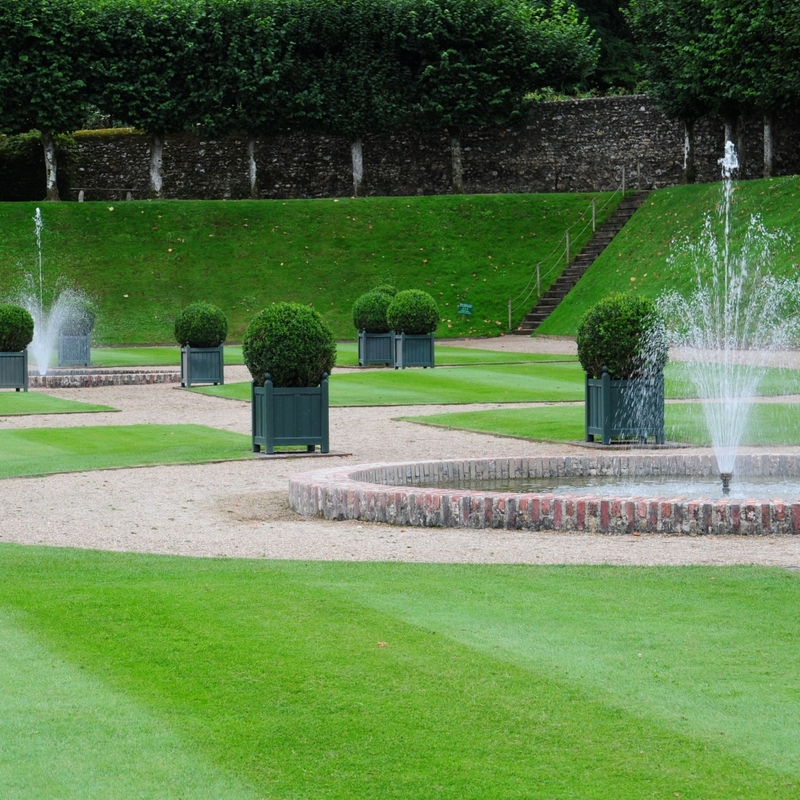 At the top of the garden is a huge ornamental lake set out in the shape of a Louis XV mirror. At first I thought this quite a boring part of the garden, there is little planting here, just a few pieces of topiary and some fountains set below a cloister-like walk under lime trees. However, it is the least busy part of the gardens (in terms of pattern and planting) and feels quite restful. and a cloud room of blues and whites. One part of the garden, which doesn't seem to have a name, combined the formality of a box parterre with the informaility of planting in the Sun Room. The blue flowers are mostly Perovskia and Salvia uglinosa and the pink are Gaura Rosyjane. The largest part of the garden is the vegetable garden. Although the production of fruit and vegetables seems to be important the emphasis is on combining colour schemes with botanic science. The garden is planted twice a year and is now organic. Everything is still planted in box-lined symmetrical beds of course. Companion planting is used to protects crops from pests and diseases. One of the best things about gardens like this is finding corners that you're not sure you're supposed to be in, like this glasshouse. More art nouveau than renaissance, but still fab. As usual there wasn't time, and less inclination, to go inside the Chateau. There was a tearoom but it was outside and it was raining and I didn't think the tea would be up to much. And there was the thought of dinner here - http://www.letapegourmande.com/ to keep me going. It was worth it (as was the long walk uphill to get there). Thanks to Rachel and Chris for a fab holiday.